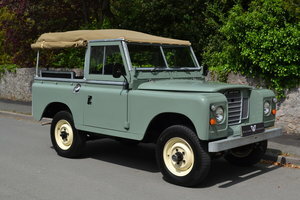 For sale, through JOHN BROWN 4X4 LTD, Land Rover ® Series 3 in Deep Bronze Green (1975). MOT Exempt. Tax Exempt. Galvanised Chassis Rebuild. Petrol 2286cc. Original Galvanised Cappings. Towbar and Electrics. Mudflaps. 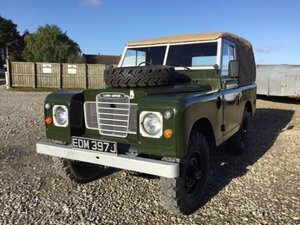 Here for sale we are delighted to present this rebuilt Series 3, which benefits from MOT and Tax Exemption. Externally, 'HBN' has remarkably straight panels and a better quality paint finish than many vehicles - this gives a pleasing period yet quality feel to the vehicle. The fact that the galvanised cappings have all survived without further intervention is an added bonus. It is also pleasing to note that the vehicle remains largely standard, but still has the usual features one might like to see in a vehicle of this type - correct steel wheels with sensible rubber, rear towbar with electrics, mudflaps, rear galvanised grab handles and front galvanised bumper. There is also a fitted dog and furniture on the bonnet should the next owner prefer to store the spare (housed in the rear) on the bonnet. The interior houses three deluxe front seats, complemented with deluxe matting.. The rest of the front dash survives in fairly original order, and there are also door cards fitted for extra comfort and soundproofing. The rear houses twin bench seats, load mat and the spare wheel. Side windows could be fitted for £495 to give a station wagon effect. Out on the road, the petrol engine drives just as it should giving a pleasing, period driving experience. 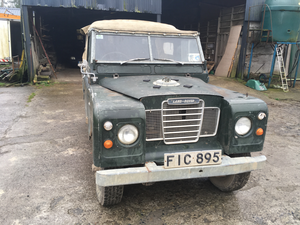 In summary, if you are looking for a tax and MOT exempt Land Rover ® which has been rebuilt onto a galvanised chassis at the minimum age which would qualify the vehicle for such privileges, then this vehicle is certainly worthy of consideration. 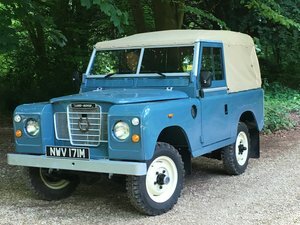 When recent rebuilds of this type can change hands or be commissioned at well over double the price, we think this vehicle represents superb value for money. 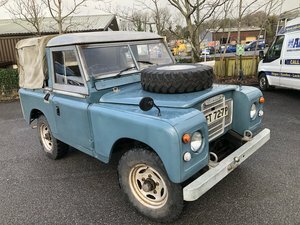 Priced at £12,995 Visit the website for comprehensive photos and a varied stock list of Series 1s, 2s and 3s. We Export Worldwide. John Brown 4x4 are the Market Leaders in Vintage Land Rover ® Sales.